We arrive by plane at Baltra Island and transfer to the dock to board the M/V Santa Cruz where we receive our welcome introductory briefing, boat drill and lunch. After breakfast, we explore the coast by panga, while our naturalist guide explains the dramatic geology of the area, nesting place for a Galápagos highlight: flightless cormorants. Depending on weather conditions, we can snorkel along the cliffs of this area rich in marine life, seasonally-visited by green sea turtles and oceanic sun fish (Mola mola). After lunch we disembark at Urbina Bay, the fascinating result of an uplifting of the ocean floor in 1954. Here we can admire corals, shells and many other calcareous organisms exposed above water. First we enjoy a snorkel from the beach, with the chance of swimming with flightless cormorants. 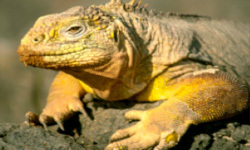 This are is also home to a large and very colourful Galápagos land iguanas, and occasionally to giant tortoises. We return back on board for our expedition plan for Saturday and dinner. We have several options available (mountain biking, kayaking in Tortuga Bay, hiking) for the afternoon, which can be discussed in advance with your Expedition Leader. At the end of the afternoon’s activities, we return to Puerto Ayora and embark on the Santa Cruz. A short walk leads us to the historic barrel where postcards are traditionally left for guests from other vessels to hand-deliver to their destinations. Near Post Office Bay, we explore the north shore of Floreana along narrow channels teeming with life. We then head back on board for lunch. Following lunch and a siesta, we take to the pangas and glass-bottom boat to explore the underwater wonders around Champion Islet, an extinct shield volcano, regarded as one of the best snorkelling spots in the archipelago. From there, it’s on to Cormorant Point, beginning with a wet landing on the olivine-crystal beach for an easy walk that includes a brackish water lagoon where bird species such as greater flamingos, pintail ducks, common stilts, herons, sandpipers, and others gather. We continue our walk over to a white-sand beach, where sea turtles emerge from the sea at night to nest (from December to May).